Scott Bubar pleaded not guilty Monday to the charge stemming from a shootout with police in Belgrade in May when his father was killed. 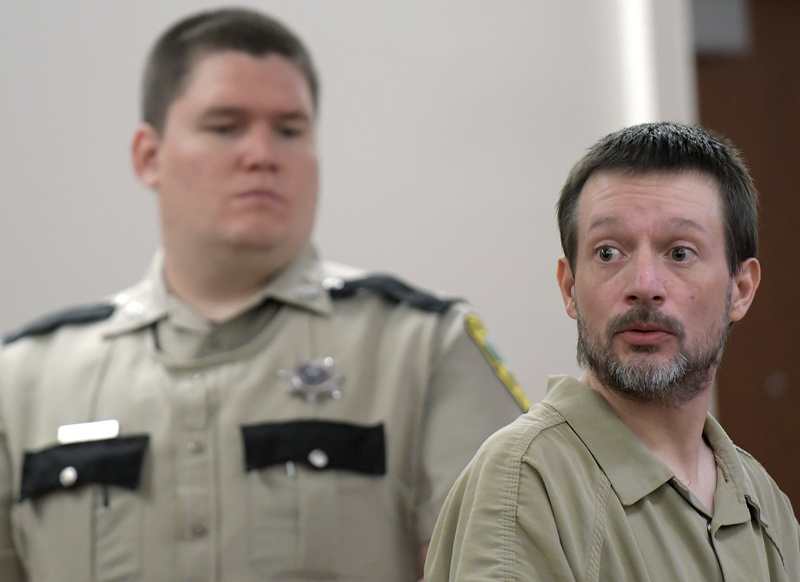 AUGUSTA — A Brunswick man pleaded not guilty Monday to charges of aggravated attempted murder of a sheriff’s deputy and reckless conduct with a firearm during a May 19 shootout with police in Belgrade. Scott Allen Bubar, 40, was shot and his father, Roger Bubar, 65, was killed by police who returned fire that night that emanated from a mobile home at 1003 Oakland Road. An indictment returned Sept. 22 by a grand jury in Kennebec County says Scott Bubar attempted to kill Kennebec County Sheriff Office Sgt. Jacob Pierce that night. Bubar had been charged earlier with reckless conduct with a firearm in connection with the shootout and was on $1,000 unsecured bail with a Maine Pretrial Services contract. However, on Monday at Bubar’s arraignment at the Capital Judicial Center, the state sought higher bail, with the prosecutor saying that circumstances have changed. Deputy District Attorney Paul Cavanaugh said the allegation in the indictment is that Bubar was “barricaded inside his father’s residence” when he shot at numerous police officers responding to a neighbor’s call about a domestic dispute. The attempted murder charge carries a maximum term of imprisonment of 30 years. Then Cavanaugh outlined the state’s motion to revoke Bubar’s bail, which was filed Sept. 22 after Brunswick police did a bail check and reported finding alcohol, needles and suboxone strips in Bubar’s apartment. Bubar was arrested that day and has been held at the Cumberland County jail on a charge of violating conditions of bail. Cavanaugh said drug tests showed Bubar had used some drugs. “The state doesn’t view unsecured bail under those two scenarios as an appropriate bail,” Cavanaugh added. He suggested a $10,000 cash bail with conditions. Justice Donald Marden ordered $2,000 cash bail with conditions on the charges in the indictment. However, Bubar remains held without bail on the state’s motion to revoke his bail. He was sent back to the Cumberland County jail after Monday’s hearing. On Monday at the Capital Judicial Center, Bubar wore a beige, one-piece jail uniform as he stood next to his defense attorney Lisa Whittier and denied violating bail. Whittier told the judge that the alcohol bottles were empty, that Bubar had not been drinking, and that the empty suboxone packaging was found under the cushions of the couch. “Mr. Bubar has acknowledged he does have a substance abuse problem,” Whittier said. She said he had been reporting to Maine Pretrial Services as ordered and been drug-tested by them while out on bail since May. She said that if he made bail, Bubar would begin counseling at the Addiction Resource Center in Brunswick and be willing to report to the Brunswick Police Department two or three times a week if the court requires. She said he had been on bail without problems since May. Whittier also said that in the discovery she’s received about the shooting incident, it was unclear whether Scott Bubar had fired shots or held a firearm. “There’s no evidence in the discovery that links him to holding a firearm,” Whittier said. She added that his only criminal conviction was a 2003 conviction for operating under the influence, and that his sisters and mother were in the courtroom on Monday to support him. A hearing on the motion to revoke bail is set for Oct. 24 in Augusta.